Gorgeous pic. Love the light. Portrays the essence of childhood summers. Lovely picture. Last chance to do that now as most of the farmers are getting their crop in. Beautiful! I love the way they’re gingerly picking their way through so as not to disturb the crop; you can tell the expression on their faces. Again, perfect lighting making their hair look ethereal and the golden glow in the sky is awesome. They were so so careful! The scratchy surface as they started walking, then the rebound of the straws as they knocked against them. 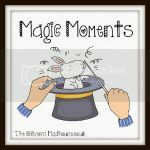 A magic moment! The light and the angle are wonderful! The photos you take Steph… they are absolutely stunning! I adore this! Stunning photo, the light just adds to this. The light in the sky is stunning. Such a lovely image, very calming. How cool. I wish I had a place around here like this. I think it would be awesome to take strolls in. I hope you guys are having a great day! A wonderful image of Summer and childhood. Beautiful! Have a fab weekend. Stunning! I agree with Sarah that it really does scream late summer. What a beautiful photo! I love the light and it seems to capture late summer perfectly.